The 2008 Colorado Republican caucuses took place on February 5, 2008, with two national delegates. 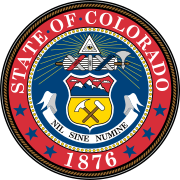 Colorado chose 21 other delegates during district conventions from May 24 to June 7, 2008. ^ a b "Colorado Republican Delegation 2008". The Green Papers. Retrieved 2008-01-28. ^ "2008 Colorado Republican Caucus". Colorado Republican Party. Archived from the original on 2008-05-28. Retrieved 2008-05-24. This page was last edited on 8 April 2019, at 22:55 (UTC).